Paul has been with MRV Architects since 1981 and has been involved with some of the largest and most complex planning and architectural projects in the region. Paul excels at leading multi-disciplinary teams through a collaborative design process to deliver notable, timely projects. He has extensive experience in Programming, Site Analysis, Construction Documents, and Contract Administration. Paul has also headed many planning projects for Southeast Alaska communities, including several large-scale greenfield development projects in Juneau. He is passionate about incorporating community input into design solutions so that each project is perfectly suited for its users. Paul is particularly interested in the impact planning policy and administration can have on creating a vibrant, economically viable, and strong community. 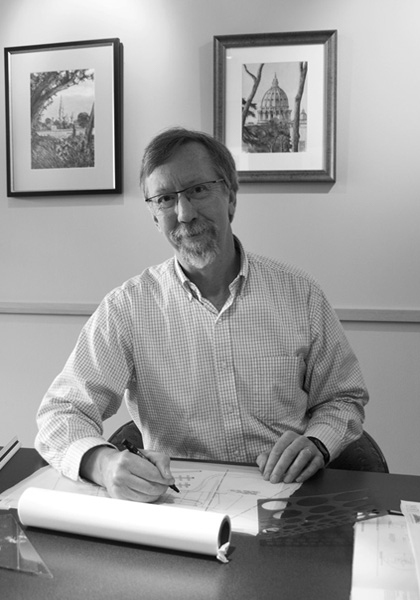 As Project Architect, Paul assists clients with zoning and planning issues, and regularly meets with and presents to the CBJ Planning Commission (of which he is a member). Paul has an in-depth understanding both of the current CBJ Land-Use Ordinances, as well as the administrative processes governing planning in the City and Borough. Paul is also an artist, a runner, and an active member of Juneau’s creative community.